(by Sarah Childress, WSJ.com) DJIBOUTI, Djibouti – Somalia’s new president, Sheikh Sharif Sheikh Ahmed, gave an optimistic but general forecast for peace in his nation, saying it will take about a year to reconcile political factions and restore stability to the war-torn country. In his first interview with a Western publication since his election, Mr. Ahmed rejected extremism and said he would need international help to rebuild Somalia after nearly two decades of clan-based violence, political upheaval and lawlessness. The 44-year-old teacher-turned-politician was elected by parliament last month, and this week plans to select his cabinet. Mr. Ahmed’s biggest challenge will be to confront the militant group Al Shabab. The group was labeled a terrorist organization by the U.S. last year and is now the most powerful force in Somalia. Al Shabab was part of Mr. Ahmed’s previous government, which was in power for six months in 2006. Somalia’s President Sheikh Sharif Sheikh Ahmed, center, amid African Union troops during a visit to the capital, Mogadishu, earlier this month. Al Shabab gained popularity by opposing the Ethiopian invasion of Somalia, and used the support to push a hard-line strain of shariah, or Islamic law, that most Somalis, including Mr. Ahmed, have denounced. The group occupies much of south-central Somalia, including the port city of Kismayo as well as Baidoa, the seat of the Somali parliament. Security is so tenuous that the government of Somalia has been living in neighboring Djibouti for the past month. Mr. Ahmed, who returned to his country briefly this month, has been staying in one of the Djiboutian president’s guest houses. A stream of visitors leaves him little time for meals; Mr. Ahmed takes time out only to answer the Muslim calls to prayer that echo across the city. Although appearing weary from a day of meetings, the soft-spoken president seemed focused and determined while discussing the problems his country faces. So far, Mr. Ahmed said, no members of Al Shabab have expressed interest in talks. He has won support, at least for now, from clan leaders weary of fighting, by declaring a fresh start. His choice of Omar Abdirashid Ali Sharmarke, a respected leader from a prominent rival clan as prime minister, could also go a long way toward healing rifts. A unified front against Al Shabab, as well as the extremists’ dwindling public support, could help the government fend off the group while building a stronger security force. In the meantime, Mr. Ahmed will rely heavily on the presence of African Union peacekeeping forces. Mr. Ahmed said he plans to return within weeks. “Somalia has been a devastated country for so long and now we’re building it from scratch,” he said. Among his priorities: training and paying security forces, helping the estimated 1.3 million internally displaced Somalis return to their homes and restoring basic services. Mr. Ahmed entered politics years ago when one of his students was kidnapped. In 2006, he became the chairman of the Union of Islamic Courts, which took power by force and ruled by shariah for six months, until being overthrown by Ethiopian troops. Mr. Ahmed was a moderate voice, but was drowned out by extremist elements. 1. a) Name the countries and ocean that border Somalia. 2. How does newly elected President Sheikh Sharif Sheikh Ahmed view the prospect of peace in Somalia? 3. a) Mr. Ahmed’s biggest challenge will be to confront the militant group Al Shabab. The group was labeled a terrorist organization by the U.S. last year and is now the most powerful force in Somalia. Al Shabab was part of Mr. Ahmed’s previous government, which was in power for six months in 2006. What offer did Mr. Ahmed make to Al Shabab? b) How will Mr. Ahmed respond if Al Shabab rejects his offer? 4. Why has the government of Somalia been living in the neighboring country of Djibouti for the past month? 5. Why might Mr. Ahmed’s choice for prime minister greatly help to unite the country? 6. What factors might help Mr. Ahmed to fend off Al Shabab while the government is building a stronger security force? 7. Read the “Background” on Somalia below. Mr. Ahmed was considered to be a moderate voice when his party last ruled Somalia in 2006. Do you think he will succeed in bringing stability to Somalia? Explain your answer. In 1960, Britain withdrew from British Somaliland to allow its protectorate to join with Italian Somaliland and form the new nation of Somalia. In 1969, a coup headed by Mohamed Siad Barre ushered in an authoritarian socialist rule that managed to impose a degree of stability in the country for a couple of decades. After the regime’s collapse early in 1991, Somalia descended into turmoil, factional fighting, and anarchy. Beginning in 1993, a two-year UN humanitarian effort (primarily in the south) was able to alleviate famine conditions, but when the UN withdrew in 1995, having suffered significant casualties, order still had not been restored. 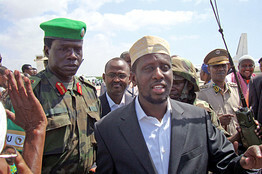 A two-year peace process, led by the Government of Kenya under the auspices of the Intergovernmental Authority on Development (IGAD), concluded in October 2004 with the election of Abdullahi Yusuf Ahmed as President of the Transitional Federal Government (TFG) of Somalia and the formation of an interim government, known as the Somalia Transitional Federal Institutions (TFIs). The Somalia TFIs include a 275-member parliamentary body, known as the Transitional Federal Assembly (TFA), a transitional Prime Minister, Nur “Adde” Hassan HUSSEIN, and a 90-member cabinet. The TFIs are based on the Transitional Federal Charter, which outlines a five-year mandate leading to the establishment of a new Somali constitution and a transition to a representative government following national elections. In June 2006, a loose coalition of clerics, business leaders, and Islamic court militias known as the Council of Islamic Courts (CIC) defeated powerful Mogadishu warlords and took control of the capital. The Courts continued to expand militarily throughout much of southern Somalia and threatened to overthrow the TFG in Baidoa. Ethiopian and TFG forces, concerned over links between some CIC factions and the al-Qaida East Africa network and the al-Qaida operatives responsible for the bombings of the U.S. embassies in Tanzania and Kenya in 1998, intervened in late December 2006, resulting in the collapse of the CIC as an organization. On December 29, 2008, Abdullahi Yusuf Ahmed announced before a united parliament in Baidoa his resignation as President of Somalia. In his speech, which was broadcast on national radio, Yusuf expressed regret at failing to end the country’s seventeen year conflict as his government had mandated to do. He also blamed the international community for its failure to support the government, and said that the speaker of parliament, Aden “Madobe” Mohamed, would succeed him in office per the charter of the Transitional Federal Government. Prime Minister Nur Hassan Hussein of the Transitional Federal Government and Sheikh Sharif Sheikh Ahmed of the opposition group Alliance for the Re-Liberation of Somalia (ARS) signed a power sharing deal in Djibouti that was brokered by the United Nations. According to the deal, Ethiopian troops were to withdraw from Somalia, giving their bases to the transitional government, African Union (AU) peacekeepers and moderate Islamist groups led by the ARS. Following the Ethiopian withdrawal, the transitional government expanded its parliament to include the opposition and elected Sheikh Ahmed as its new president on January 31, 2009. For background information on Somalia, go to the CIA World FactBook. Read about sharia law (Islamic law – by which governments of many Muslim countries abide) at cfr.org.